William P. Roberts was excluded from Presidential amnesty under the third exception, due to his service as Brigadier General in the Confederate Army. Roberts insisted that he was not part of the political discourse which led to secession, and sought only to do his duty to his state. He explained that he wished to be granted amnesty and have his rights restored because he had several family members whose "prosperity and happiness" were "mostly dependent upon him." 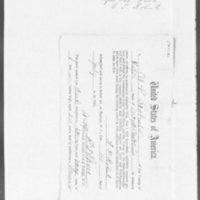 William P. Roberts, Amnesty Petition, August 26, 1865, Case Files of Applications from Former Confederates for Presidential Pardons ("Amnesty Papers"), 1865-67, Records of the Adjutant General's Office, 1780s-1917, Record Group 94, Publication M1003, National Archives, Washington, D.C.
William P. Roberts, Amnesty Petition of William P. Roberts, August 26, 1865, Civil War Era NC, accessed April 24, 2019, https://cwnc.omeka.chass.ncsu.edu/items/show/475.